Although still young, Chinese-American scientist Jau-Fei Chen has already carved out a territory of her own. Starting with immunology and combining it with Chinese herbal medicine, she has created "nutritional immunology." Though a new field of study, its existence proves yet again the old adage that "an ounce of prevention is worth a pound of cure." "Our immune system is like an army, protecting us from invading pathogens. B-cells produce all kinds of weapons, antibodies, which recognize different invaders. Macrophages are like street cleaners, responsible for eliminating the corpses of cells killed in battle, eating bacteria. . . "
In a packed Taipei International Convention Center, a young woman with an array of charts and graphs speaks confidently from the stage. She is explaining the importance of the immune system and how to care for it. The audience is impressed not only with her knowledge, but also with her person. "She's so young!" whisper listeners seated in the auditorium. And her eye-catching beauty contrasts with most people's expectations of what a scientist looks like. Born in Chiayi, Chen emigrated with her family when she was 10 years old. Though she may be unfamiliar to Taiwanese, her name is very well known in the American Overseas Chinese community. 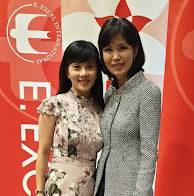 The 34-year-old Chen not only holds a doctorate in microbiology from Brigham Young University, she also founded E. Excel International ten years ago. The company, which makes health products from extracts of Chinese medicinal herbs, has made a name for nutritional immunology. In just a few short years, the company has expanded from America to 11 countries including France, Malaysia, Taiwan, Japan and Korea. This year, its products will even invade Shanghai. She has been selected as one of the World News Organization's 100 Outstanding Overseas Chinese in America. In 1993, she received the Second Overseas Chinese Entrepreneur of the Year Award. In 1996, she was selected as one of America's Outstanding Women and California's Legislature named March 8 of that year Jau-Fei Chen Day. In January of this year, she was named one of the Ten Outstanding Young Americans by the US Junior Chamber of Commerce, the first time in the award's 59-year history that it has been given to a person of Chinese descent. The ten award recipients were selected from more than 100 candidates. The winners included a person devoted to protecting children from sexual abuse, another engaged in promoting the environmental protection cause, a legislator and an Air Force pilot. Chen was selected for her many years of effort to promote nutritional immunology around the globe, her creation of an international organization to produce and market related food products, and her contribution to health care through education about nutrition. In addition to business and community service awards, in 1992, Chen also received the Martin de la Cruz Award, herbal medicine's highest honor. And last year, at the annual Conference of World Traditional Medicine, she received awards for best product (for a cactus-derived product) and for best written work. What is this nutritional immunology which has received such numerous accolades? And how did Chen become involved with this research? The thinking behind nutritional immunology is really very simple, emphasizing that an ounce of prevention is worth a pound of cure. Chen explains that the body's internal balance and the immune system are intimately connected. Moreover, nutrition strongly affects the immune system's capabilities. An unbalanced diet impairs the effectiveness of immune cells, making the body more vulnerable to bacterial and viral invasions and to chronic ailments. This seemingly common-sense point of view is actually a reaction to modern medicine. For more than 100 years, modern medicine has pursued the development of faster, more effective methods of fighting off bacteria and viruses. For example, in 1928, antibiotics, commonly viewed by both doctors and patients as an especially effective medication, were developed. But pathogens are keeping pace with such improvements in medication. Antibiotics may destroy 99 percent of invading bacteria, but the remaining one percent are "trained" by the drug, becoming "super bacteria." Ultimately, no medication is effective in eliminating these "super bacteria." Chen gives other examples of problems facing modern medicine. The Hanta virus, which originally only afflicted rodents, has now become a threat to humans. This virus kills its host within 48 hours of infection. And tuberculosis, a disease once thought to have been eliminated, has returned. Many in the medical community are concerned that even vaccines will no longer be effective in preventing many illnesses. Then there is cancer, the mere mention of which causes many to pale, which begins with changes in the body's own cells. According to statistics, for the last 15 years, cancer has been the leading cause of death in Taiwan. Scientists researching its causes have found that after congenital factors, the most important factor is problems in the victim's own immune system which have made it unable to ward off foreign invaders. And then there is AIDS, which has created world-wide panic. The HIV virus which causes it disables its victim's immune system. Scientists are making an all-out effort to find a cure. Such impasses have caused the medical community to begin rethinking its approach to illness. Instead of continuing to "treat the head if the head hurts, treat the foot if the foot hurts," the new thinking is that treatment should be directed at the causes of illness in the system as a whole. The medical community is also beginning to look to the body's own immune system for answers. In spite of the growing attention given to immunology over the last 20 years (and especially, given the AIDS epidemic, over the past 10) it remains a relatively new field of medical study. In the early years of research in the 1960s, efforts were devoted to research on vaccines. Vaccination, the injecting of dead or weakened bacteria or viruses into the body, stimulates the immune system to produce antibodies, allowing the body to "know the face of the enemy." More recently, scientists have moved on to more fundamental research, discovering that in addition to defending the body from foreign invaders, the immune system gets rid of wastes and can repair internal systems. Further, "If it is operating normally, the immune system is more powerful than any medication," says Chen. With modern countries moving towards national health insurance, preventive medicine is receiving increasing attention because it can reduce a country's health care expenditures. So how did the idea of nutritional immunology come into being? Although it sounds like common sense (Chen herself is sure that others must have seen the connection between the two), it was Chen who first expressed the relationship in a systematic way. Chen's original field of study was immunology. She entered Brigham Young at the age of 16 and from there went directly on to graduate school, receiving her Master's degree in immunology. At 26, she completed her PhD in microbiology. While working on her PhD, she was involved with research on cancer medications. "It was ten years of disappointment," she says. The efficacy of chemotherapies is limited because at the same time the drugs destroy the cancerous cells, they also destroy healthy cells. Seeing the suffering of cancer victims undergoing chemotherapy, she began to have doubts about the direction of the research she was doing, eventually giving it up to investigate the condition of the patients. Going one step further, she changed her focus from looking for a cure to prevention. "If we could nourish the immune system to enable the body to ward off an invasion of pathogens, that would be even better than going to see a doctor after one is already sick." Chen discovered that the causes of cancer were closely related to diet. If a person eats too much meat, the animal protein and cholesterol cause the production of a hormone within the body which impairs the function of the immune system. For this reason, her nutritional immunology research has focused exclusively on plants. "Plants have a lot of nutrients as well as phytochemicals. These strengthen the immune system and limit the growth and dispersion of tumors and cancerous cells." Soybeans are a good example of such a plant. People can't help but wonder if her choice of medicinal herbs as the focus of her research is related to her being Chinese. To this Chen says that being Chinese, she had been exposed to Chinese medicines. But as for her research, she says that works such as A Compendium of Medicinal Herbs focus largely on the medicinal uses of plants, while what she is looking for are edible plants. She says, "Traditional knowledge only gives you something to consider." Moreover, Chinese pharmacological works are often incomplete and rather unclear. She says that to find plants with value as nutritional supplements, she still must rely on accurate experimental data. In the laboratory, the first step is to test plants for toxicity. After this, research into which nutrients beneficial to humans they may possess, and how much of them, may begin. For example, more than 100 nutrients can be extracted from mandarin oranges, while more than 10,000 can be found in a cactus. The time at which the plants are harvested is also critical. "In the case of Ganoderma lucidum, the younger the better. Thousand-year-old Ganoderma lucidum is just a creation of kung-fu novels," she says with a laugh. Which portion of the plant is used is also very important. The fruit of the common loofah is very nutritious, but the best part of it is the sap from the vines. Although Chen has not based her research entirely on traditional Chinese lore, the bottleneck in which Western medicine has found itself stuck in recent years and the resurgence in interest in traditional Chinese medicine both have certainly contributed to the recognition of nutritional immunology as a legitimate field of inquiry and the many awards Chen has won. Sun An-ti, a physician at National Taiwan University Hospital with a PhD in immunology, says that in recent years Western medicine has hit a bottleneck. Seeking a breakthrough, people are turning to the study of traditional Chinese medicine. Against this background, he feels Chen's bringing Chinese herbal medicine in on top of a foundation of Western immunology is "visionary." Dr. Sun also notes that, though the ancients lacked the word "immune," they did have the concept of "rectifying the root and eliminating the bad." Rectifying the root means, in modern terms, increasing immunity, while eliminating the bad means removing toxins from the body, thus pre-empting illness. "If these two points can be practiced, 80% of illnesses would never get to the body in the first place," he says. Jack Yang, president of the Deh Yu Junior College of Nursing, who looks at this issue from the point of view of nutrition, reaches a similar conclusion. China has long had the concepts "food can treat illness and build up the life force," and "food and medicine come from the same source." Because Western medicine is limited in effectiveness against chronic illnesses, help is being sought in traditional concepts of preventive medicine, using herbs to restore balance to the body rather than turning to pharmaceuticals. "In the past people thought of food mainly in terms of providing nutrition and satisfying their appetite. But recent research is starting to focus on the health functions of particular ingredients in food," says Yang. The herbal foods in traditional Chinese dietary culture are an important source of special healthful ingredients. In fact, there is no conflict between East and West about these ideas. As early as 2500 years ago, Hippocrates, the father of Western medicine, said "Let food be your medicine, and medicine be your food." And isn't there a Western saying, "an apple a day keeps the doctor away"? Why wasn't Jau-Fei Chen just satisfied doing research? Why did she plunge into the business world? When she established E. Excel in 1987, it was at first purely a research organization. Two years later the company began to manufacture products, "mainly because we wanted to use sales to stabilize funding for research," says Chen. She emphasizes, "I have always placed the greatest importance on education and research." In the typical medical school curriculum, immunology and nutrition studies are two separate courses. Immunology is considered a branch of medicine, while nutritionists need not study immunology. Through her efforts, more than 10 medical schools in the US have already established classes in "nutritional immunology." She and her research staff are often invited to speak to middle and primary school students in the state of Utah. Using cartoons and computer animation, they depict how immune cells fight their enemies, and compare phagocytes to "garbage trucks." The kids are captivated. Chen and her staff have also produced a multi-media instructional video on nutritional immunology, which has been shown on nationwide public TV in the US. In terms of R&D, besides corralling numerous experts in immunology, nutrition, and herbal medicine, Chen also cooperates with many medical schools in the US and the PRC. She offers scholarships to students doing related research, while the company gets access to the schools' expensive lab equipment and experts. E. Excel headquarters is located in Springsville, Utah, about 40 minutes from the state capital of Salt Lake City. Utah is famous for its beautiful mountain scenery. We visited in mid-March, with winter not quite gone, and the mountains were snow-capped. Locals said it was too bad we didn't come in spring, when the scene turns green. Because the state government has strict regulations for heavy industry, the environment is clean, and many health food companies have set up headquarters there. Utah is also the main home of the Mormon religion, and pornographic films and publications are banned. Brigham Young University, where Chen studied, is famous for its strict rules. Guys' hair cannot go below the shirt collar, and women may not wear super short skirts. This is very unusual in America, where most universities extol individualism. This is Chen's second home abroad. When she was 10 her whole family moved to Brazil, where she was the only Chinese in her class. She couldn't understand a word, and was for a time thought to have a learning disability, so she was sent for special education. But after getting the hang of the language, she quickly caught up, and graduated first in her high school class at the age of 15. Later she came to Utah with her parents. When Chen was studying for her PhD at BYU, she began to teach advanced immunology. At that time many of her students were older than her; she even taught her own older sister. When they met in class, both were very surprised. She still recalls that in the first class, she sat offstage, too nervous to go to the lectern. Seeing this beautiful Chinese girl, thinking she was a new classmate, the boy sitting next to her asked her out to a movie. What is it about Chen, who has an older brother and three older sisters, that has allowed her to stand out while still so young? Mrs. Chen says that her daughter has never given her any cause for worry. Her sister Jau-hwa says that it seems as if her little sister has grown up without really being aware of it. "She loves to learn. In school she often stayed in the lab very late, so she got really good at grabbing mice!" That is how Mom Chen describes her little girl. Jau-Fei Chen says that science is easy for her. But why? She thinks, then says, "Most people study just to get the diploma, and they feel pressure whenever they meet difficulties. I don't care so much about degrees, yet I have studied all the way through to my PhD. Maybe because I have not felt pressure, I have been able to see the larger picture, and thus quickly find the problems in experiments." Mrs. Chen relates that Jau-Fei "went to study piano at the age of five. At first the teacher didn't want to take her on as a student, but she could absorb vast amounts. Whatever he taught she would learn, and by her third year she was winning prizes." Recalling these long ago events, Mrs. Chen still cannot conceal her pride. Jau-Fei still plays from time to time. When she has a difficult problem to mull over, she will sit at the piano, playing Chopin or Beethoven as she ponders. You can chalk up her meeting with her husband, Zhang Ruikang, to the piano. A Shanghainese, Zhang won a scholarship to study voice at BYU. Once, unable to find an accompanist for a competition, a friend asked Chen to help out, and that is how they met. But in that era of confrontation between the two sides of the Taiwan Strait, Taiwan classmates warned her not to "fraternize with Communists." Today they run the company together, she as chairman and he as general manager. Sitting in their luxurious home on a hillside, and gazing out over the huge stretch of apple and peach orchards, then looking back at this talented and attractive couple with their three vivacious children, it makes one wonder whether this isn't a fairy tale come to life. "She's a very special person," says Li Huan-hsin, general manager of E. Excel's Taiwan branch. He describes her as very intelligent, and very ambitious, even running all over to promote her ideas when she was pregnant; but at the same time she is modest and affable, and her life is very simple. The Taiwan branch was set up in 1990. In the increasingly flourishing multi-level sales market for health foods, E. Excel, relying mainly on products using natural herbs, has in a few short years already caught up to many long-established firms in terms of sales. Setting up a company and doing promotion has allowed even more people to understand the importance of nutritional balance, and there's nothing to criticize in that. As for the efficacy of these products, because the ROC Department of Health prohibits makers of foods from claiming health effects, it's hard to tell. But Chiang Wen-chang, a professor of food technology at National Taiwan University, says that if you see that the ingredients are all natural vegetation, then at least they should be safe. Sun An-ti, an authority on immunology, affirms the concept behind nutritional immunology. But, even more, he hopes that a company as large as E. Excel can provide more basic experimental evidence. "If there are no clinical tests, at least there must be reports about tests on animals. This would be more responsible to the public." Other people wonder about the price of these health foods: "If the object is to get people to use them, then why aren't they sold at ordinary prices, so more people can enjoy the benefits?" Chen responds to such questions by saying that, if you see these as being like ordinary Chinese medicine, of course there will be skepticism. But in the production process, from cultivation to selection and culling, nothing can be done lackadaisically. For example, you can't get much juice out of a cactus, and when you husk pollen you only end up with one pound out of ten. So naturally production costs are not low. Chen emphasizes that health and the immune system rely foremost on nutrition, especially fresh fruit and vegetables, of which you should eat 15 types a day. Can concentrates serve just as well? Chen says that of course fresh vegetables are the best choice. Its just that busy people today have little time to keep track of nutrition, so "fast health food" is produced for the sake of convenience, not because it is better. People who see her with both a happy family life and career success, winning prize after prize, think her life must be easy. How does she feel? She says lightly that she is no different than anyone else. But, she adds, when she uses sales in the marketplace to promote science, others look at her in a new light. "Sometimes I think selling is holding me back," she says, with a trace of grievance in her tone. But Chen has great faith in nutritional immunology. "Anything that conforms to nature can't be too far wrong." Her greatest desire is to bring Western immunology and Chinese herbal medicine together to create a new science and leave her mark in medical history. "I also want people to know that China is not only a place with history, that it has modern science also." Only time will tell whether or not she can realize this desire. And Chen's wish is perhaps shared by all Chinese people. (left & right) Jau-Fei Chen, one of Ten Outstanding Young Americans chosen this year by the US Junior Chamber of Commerce, stresses the importance of good nutrition to the immune system. Her extraction of useful products from edible medicinal plants has been slowly gaining the attention of the medical community. Thousand-year-old Ganoderma lucidum appears in kung-fu novels as the source of immortality pills and much conflict. But according to scientists, at least in the case of Ganoderma lucidum, the younger it is, the more effective. The lowly cactus should not be underestimated; it is packed with thousands of nutrients. Dried water lilies can be brewed into a tea which, according to Chinese medicine, can improve the skin and metabolic functions. The headquarters of E. Excel, the company founded by Jau-Fei Chen, is located in Utah in the US; in the background are snow-capped peaks. Through extraction, mixing, concentration, and packaging, every step of the production process must be rigorously monitored to insure quality. A Jau-Fei Chen family picture. Its hard to imagine that this trim woman is already the mother of three.